The Business & Sustainable Development Commission is a two-year initiative to commit business leaders to align their companies with the UN’s Global Goals for Sustainable Development. 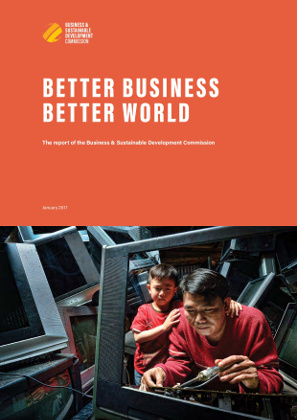 Launched at the 2016 World Economic Forum in Davos, the Commission’s report Better Business, Better World provides evidence-based arguments and case studies that - perhaps for the first time - convincingly illustrate the benefits to business of pursuing the Global Goals. The report finds that sustainable business models could open up at least US$12 trillion of economic opportunities and create up to 380 million jobs by 2030 globally. SYSTEMIQ's leaders have been involved with the Commission since its inception. SYSTEMIQ gives strategic support to the Commission's Secretariat as well as research and content expertise to its initiatives and outputs, including Better Business, Better World. launching regional reports to highlight compelling business opportunities in line with the goals in each region. The Commission reaches out with its partners to support the growing network of CEOs and other executives who are championing the business case for the Global Goals. The Commission officially closes its doors in January 2018, when the network will have established its own momentum and handed over its agenda to core partners.